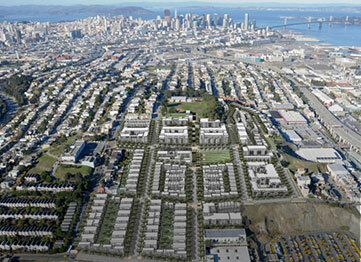 VMWP and GLS’s Rebuild Potrero HOPE SF project just won a Research, Planning, Analysis and Communication Merit Award. Rebuild Potrero is a 38-acre redevelopment site on the steep south facing slope of Potrero Hill. 606 units of aging federally owned public housing will be replaced with new public housing, subsidized by a denser and more diverse mix of market rate and affordable housing with streets, parks, community services, recreation and retail. A new street grid supporting higher densities and dramatic views will replace the low density suburban site plan, which has left the neighborhood socially and physically isolated from the adjacent historic working class neighborhood, transit and services.